This post on the life, culture and economy of a Brazilian archipelago comes from Thousand Nations reader Anthony Ling. Having visited the island of Fernando de Noronha and noticing how similar isolated island is to an actual Seasted, I came up with this article focusing on how the resident community deals with their problems and basically what’s their lifestyle in the middle of the Atlantic, at about 300km from Brazil’s coastline. Population: Housing around 3000 residents, the island receives around 200 visitors daily. Maximum number of visitors in the island at the same time is around 400. The limitation is mostly due to the environmental restrictions existing in the island. Its density very low close to Brazilian cities: only 154/km2, in 18km2 of land. Housing: Living costs are unusually high in the island, though government bureaucracy is mostly to blame. As building and land ownership is restricted to island residents, a huge number of fees have to be payed and people have to wait in lines to get permits, even for small refurbishments. As expected, a lot of unregulated building takes place. Some resident families end up having up to 10 people living in the same house to avoid building bureaucracy. Building materials have to come from the mainland, and residents claim the transportation costs are almost equivalent to the cost of building an entire house in continental Pernambuco, the state which Fernando de Noronha is officially part of. These regulations incentivize residents to invest as much as possible outside the island and not in their own businesses, as they do not own their property. Lodging is also expensive. The cheapest place to stay are in small rooms built by residents to make some extra money, starting from around R$350,00/U$200,00/room/night and the most expensive hotels charge from R$800,00-1500,00/U$450-900/room/night. Food: Practically everything comes from the mainland, so food and water is expensive, though not abusive. A cheap meal (grilled fish under an old wooden tent) is around R$30,00/U$18,00/person, and the best meal in the island costs around R$100,00/U$60,00/person. A half-liter bottle of water in the city market costs around R$3,00/U$1,80, and in the hotels they are almost triple the price. As the territory is practically entirely a national park with severe environmental restrictions, agriculture and manufacturing activities are forbidden. Some websites claim there is a permission to grow sheep, though I did not see this happening during the trip. Fishing is also forbidden, as everything is part of the natural protected environment, though some residents do it anyway. Infrastructure: Roads are terrible, mostly due to the harsh environmental restrictions that are imposed in the island, as administration claims roads “waterproof the soil and damage the environment”. There is one main paved road which crosses the island, all of the rest are unpaved (soil and rocks). The airport is basically a landing strip with a minimal terminal, attending around 3 flights a day from 2 different Brazilian airlines. Flights respond to around 75% of the island visitors, the rest arriving by sea. Some transportation is done by the coastline, though the lack of docking stations (currently there is only 1 fully operating port) makes it hard: boats cannot dock on the beaches as they are also protected. Economy: Everything is ecotourism-driven. The beaches and natural beauties attract tourists from all over the world. There are some historical sites which are protected by local and federal government, but they don’t attract as near as many tourists as surfing and diving do. Some scientific research is done by government institutions, mainly studying local wildlife, but it probably costs more money than it makes. Workers come from all over Brazil, usually young people looking for new life-changing experiences. It’s common to hear people saying they expected to stay for only 2 or 3 months but are now living there for the last two years. 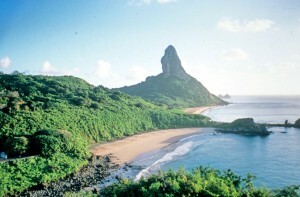 Besides regular Brazilian taxes, all visitors are charged a Environmental Protection Fee (the “TPA”), today at R$40,40/U$25,00/visitor/day on the island. The state of Pernambuco spends R$14,6 million/U$8.50 million/year on the island, mostly paying for public worker’s salaries and public education and health costs. The rest (around R$13 million/U$8 million) comes from the TPA and tourism revenues. GDP per capita ends up being very low, around R$10000/U$6000/year, which corresponds to about half the Brazilian average. Energy: The island’s main energy source is a diesel fuel plant, even though the entire island is a protected environment. They had a wind turbine that attended 6% of the island’s demand, though it was recently shut down. Trash: Around 10t of trash is produced during high season and it all goes to the mainland by ship. The same ships that bring building materials and other non-food materials come around one every 15 days to pick up the trash on their way back to the continent. The maximum amount of trash that can be transported by this ship from the island to the mainland is 90t in 20 days. The island is currently facing problems with trash accumulation due to some delays with the ship. Transportation: Gasoline buggys are used to go from one place to another. Owning a buggy has similar restrictions as owning land: you have to be a resident (their number is also limited) and there are several taxes one should pay and lines one should enter, turning buggys around 3 times more expensive than the ones sold in the mainland. There is one gas station in the island operated by Petrobras, Brazil’s “mixed capital” state-contolled oil company, selling the country’s most expensive gasoline: R$3,78/U$2,15/liter. There is also a very small bus line operated privately with a public concession. It’s fare price is around R$3,50/U$2,00, just a bit over the fare payed in large Brazilian cities. Leisure: For residents, leisure options are minimal. As the island is very small and tourism oriented, most residents aren’t enjoyed by the beaches and natural beauties. Many of them even get sick of it, as the landscapes and daily routines are always the same (think of taking the same Disney ride over and over again everyday). Tourist attractions are mostly environmental ones, and limited to the islands’ size: trekking, snorkeling, horseback riding and boat rides, with the most significant ones being surfing and diving, known to be the country’s best spot for both. There are no cinemas, theatres or other cultural options. Education: There is small a public school attending the children in the island, with pretty good infrastructure for Brazilian standards but with bad ratings from the Brazilian national public school rating system (IDEB). Health: There is a public hospital in the island. It is said treatment is good for small heath issues, though for more severe treatment patients have to be transported to hospitals in Recife, the capital of Pernambuco. Local administrators also appear to have a policy against births in the island: they don’t have professionals to take care of pregnant women, forcing them to go to the mainland to give birth. Some say it is due to lack of qualified people wanting to work in the island, but probably the main reason (and known by islanders) is because people who are born in the island are citizens, who then have land property rights. Money: There is only one Santander bank agency operating in the island. The public Caixa Econômica bank only has an ATM, and Banco do Brasil isn’t available (proving private banks can attend very small communities in distant places). Security: The Military Police (commonly known in Brazilian cities for street patrol) has 24 officers working the daily routines. Residents say it’s the safest place to live in, and people even leave their keys inside their buggys (very unusual in Brazilian cities). Defense: The Brazilian Air Force has a small base on the island, though it works mainly with the transportation of Brazilian authorities and politicians. The Marines have a more significant job, with a troop and ships defending the island. The Brazilian Military does constant monitoring on the island as it is considered a strategical base: it is considered an essential position to defend the “Pré-Sal”, the deep ocean oil reserves recently found close to the Brazilian coastline. Overall: Overregulation in many environmental issues and contradictory social and environmental policies leave island residents in a bad situation, as I wrote about on my personal blog. As I see it, Seasteading comes out as a winner in practically all categories analyzed, not facing Fernando de Noronha’s worst problems: the strict environmental regulation, the lack of leisure options and the notoriously bad Brazilian public sector education and health services. Food, trash and energy (which I thought could be a tough job) seem to be pretty much taken care of. The hardest problem would be defense, though maybe not seasteading close to oil reserves or other valuable natural resources could make things much easier.